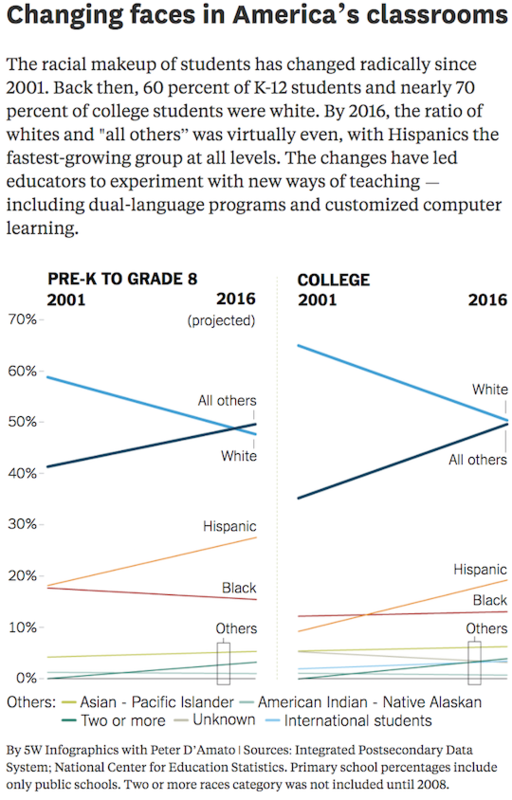 The New York Times has a new education supplement, called Learning, and The Hechinger Report is collaborating with the Times to produce Bulletin Board, a collection of noteworthy ideas and trends in education that will appear on page 2 of the section, which will come out four times a year. The April issue’s theme was “Nontraditional learning.” Highlights from Bulletin Board follow. About five million K-12 students in the United States do not speak English fluently, and their numbers are growing fast. While these children currently make up 10 percent of the total student population, researchers estimate that they could make up as much as 40 percent by 2030. Schools across the country are turning to technology to help them better serve these students — whose success will increasingly drive graduation rates, test scores and other school-quality metrics — and to help connect with their families. “Any time there’s an opportunity to quickly connect with a parent and not have the language be in the way, that’s a win for me and for the student,” said Tasia Fields, a technology administrator and former teacher in Waukegan Public Schools in Illinois. ClassDojo is among the most widely used home-to-school communication apps, and its automatic translation feature has created a way for teachers to develop relationships with parents despite language barriers. Ms. Fields said the app enabled regular contact with all parents — to discuss grades or attendance issues, for example — not just those who speak English. In the classroom, computer-based programs can give students additional support as they work to master the vocabulary and mechanics of English. ELLoquence, Istation and PreK12Plaza are among those that let students move through lessons at their own pace. Many more schools serve immigrants now than ever before, and digital technology can offer effective ways to reach them. Many administrators at public schools say they are using strategies to “personalize” learning, giving students the chance to tackle coursework at their own pace or have a greater say in what they study. And some, like the Howard University Middle School of Mathematics and Science in Washington, have specifically turned to the method as a way to address inequity. CityBridge — a nonprofit focused on improving Washington’s public schools in part by giving students a voice in the reform conversation — is helping the school, which is on the Howard University campus. The middle school has started using an online system to guide self-paced learning, and Ms. Procope is going one step further, letting the students help redesign the class schedule. Her hope is that if the school day is organized around the needs of more students, students will be better set up for success. Damont Morgan, a seventh grader, would prefer to get core academic classes that take a lot of mental energy out of the way in the morning and go to electives in the afternoon. As part of a pilot, he is testing this, and Ms. Procope plans to change the schedule schoolwide next year. She also plans to carve out time for students to choose what to study. For CityBridge, student participation in school redesign is essential to dismantling many of the inequities that have made schools work for some students and not others. And that, these advocates say, is the real goal for personalized learning. With more college students now considered nontraditional than traditional, higher education institutions have been scrambling to shift their models to better meet their needs. Many have turned to competency-based education, known as CBE, to reach the increasingly important returning adult learner. These students graduated from high school years ago and have work and life experiences that distinguish them from their young adult counterparts on campus. With competency-based education, they can earn credits for that. The idea is that students should not have to sit through lessons they have already learned. Once they prove their knowledge — competency — they can move on to new material. The model is popular with older learners who want to finish a degree as fast as possible, and online delivery means they can do it in evenings and weekends, or around their work and family commitments. In 2014, about 50 colleges had either announced or started CBE programs. In 2017, the education research firm Eduventures issued a report about 175 institutions with some level of CBE, even if just a course or two. Hundreds more say they are considering such programs. But competency-based education is hard to put into effect because it is so different from traditional higher education — in the way courses are designed, the way faculty members are expected to teach, how long courses take and how students should be charged. BLENDED LEARNING Any instruction that blends the use of computers with human teachers. PERSONALIZED LEARNING An instructional model in which each student studies at his or her own pace, often aided by technology. The student may also have some choice in what to study, the order in which topics are studied or the learning method. STUDENT-CENTERED LEARNING Another term for personalized learning, but tending to emphasize the needs of individual students rather than the goals of the teacher, school or district. COMPETENCY-BASED LEARNING A method of instruction that requires students to master material (demonstrate competency) before moving on to the next topic or phase of instruction, instead of proceeding based on traditional unit or semester time frames. MASTERY-BASED LEARNING Another term for competency-based learning. PROFICIENCY-BASED LEARNING Another term for competency-based learning. VIRTUAL LEARNING/VIRTUAL SCHOOL Usually refers to a class or a school where all the content and process of learning are online. STANDARDS-BASED LEARNING Tying instruction to certain standards agreed upon as the goals for what students should know at various ages or grades in school (standards often set by the state). All 50 states have standards for their students to meet — most use, at least in part, the Common Core standards. COMMON CORE STATE STANDARDS Academic standards in English language arts and math, created by a national task force and based on the best state curriculums and input from experts. The process began in 2009 and Common Core, as it is known, has been adopted in 41 states and the District of Columbia. NAEP The National Assessment of Education Progress, a standardized test given periodically (every two years, in most subjects) that enables progress to be compared in all states on the same test. ASSESSMENTS Essentially another word for tests, but not necessarily old-fashioned tests. “Next generation” assessments include student portfolios, capstone projects or other work. MASTERY-BASED GRADING Also known as competency-based grading. A grading system that separates academic mastery from classroom behavior. Many schools give students two grades, one based on how well they mastered the content and another based on their attendance, class participation, homework completion and so on. OPEN EDUCATIONAL RESOURCES Educational materials that are free and openly licensed.